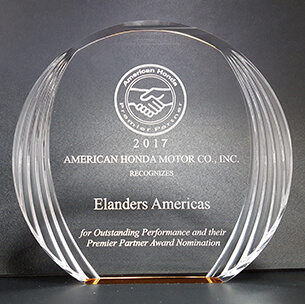 Davenport, Iowa – December 13, 2017 – Elanders Americas has been recognized by American Honda Motor Co., Inc. for Outstanding Performance in their Premier Partner Award Program – an honor that places Elanders Americas in an exclusive and elite group of suppliers. Nominations were submitted by American Honda Motor Company, Inc. personnel who felt strongly about the high level of quality service Elanders Americas provides. Out of 1,000 eligible suppliers, Elanders Americas was one of only 70 nominate. Elanders Americas first provided high-end color products for Honda Power Equipment through our Atlanta, Georgia facility. Building upon Honda Power Equipment’s trust in our competence and innovative nature, our Davenport, Iowa facility collaboratively developed a POD (print-on-demand) solution that eliminated inventory, associated scrap costs, and weekly shipments from Michigan to Georgia. Confidence in our ability to deliver a quality product while meeting the turn-time requirements of the Honda Power Equipment facilities has continued to strengthen our partnership. Elanders Americas now provides full color, black and white, long-run, and short-run products in digital and offset print formats as well as output to electronic and digital mediums supporting Honda Power Equipment’s dealer network, and from time-to-time their OEM members.